In 1985 the science world was shaken by a new discovery that has, and is still transforming our understanding of carbon. What follows is a brief account of the discovery of a family of carbon cage molecules called the Fullerenes - the third allotropic form of carbon. In 1996 the chemistry Nobel Prize was awarded for its discovery. This story is an exciting development in the history of science and a vibrant new area of nanotechnology. Since going to press some new results have been published: C60 and the fullerenes were discovered on Earth as a unexpected result of experiment trying to mimic chemistry that might be going on in the material produced from stars and possibly within molecular clouds in the inter stellar medium. On the 22nd July 2010 scientists revealed that C60 has finally been detected in the ejected material from a star 6500 light years away. Carbon must rate as one of the most studied of the 92 naturally occurring chemical elements. Yet it was only in 1985 that completely new forms of pure carbon were unexpectedly discovered [1-9]. These are the Fullerenes; Buckminsterfullerene (also called C60) being the head of these fascinating new structures . In 1996 the Nobel Prize for chemistry was awarded to Kroto, Curl and Smalley for the discovery . I was lucky enough to be involved in some of this pioneering work during my PhD studies . Diamond and graphite are the pure forms of carbon that we learn about early on in science education - they are the two allotropes of carbon. They are classic examples of how the same atoms can have very different properties when combined together depending on the way the atoms are arranged - i.e. their structure. In diamond each atom is joined to four neighbouring atoms in a 3D tetrahedral 'scaffolding' type structure which accounts for its great strength. In graphite the atoms have three neighbours forming predominantly flat 2D hexagonal sheet networks. In graphite the sheets lie one upon the other and are fairly weakly bound together and so easily part, making graphite soft and lubricating. They get their names from the ancient Greek; diamond meaning 'invincible' - the hardest naturally occurring material, while graphite means to 'write' it's still used today in pencil 'leads'. Bearing in mind the wide use of carbon and its importance to humans throughout the ages it's very surprising that it was only relatively recently (1985) that another, third form, of carbon was discovered. In a paper we wrote in 1992 Harry Kroto and I outlined the wide spread and vital role carbon plays in the universe . Astronomy has played two key roles in the discovery and development of the Fullerenes; in fact without this 'blue sky' research the fullerenes might still be awaiting discovery. When these molecules tumble and rotate in a gas (because of the thermal energy) they often radiate energy at the same frequency as they rotate. This 'rotational emission' is in the radio wave (microwave) part of the electromagnetic spectrum. David Walton and his students would make the molecules while Harry Kroto and colleagues would measure their corresponding microwave spectrum. This data would be given to the radio astronomers who would turn their antennas and receivers to carbon rich objects in the universe to try and spot their tale-tale signs. Not only were many of the laboratory molecules observed but they were in great abundance in the vast molecular clouds in space. The emission spectra can be used to estimate the abundance and average temperatures within these clouds. The molecular microwave emissions are crucial in allowing energy to escape as gas clouds (gravitationally) collapses. It allows the heating effect of compression to dissipate eventually forming conditions dense enough for stars to form. Dense molecular clouds can be the birth place of stars. In order to try and understand why carbon molecules were so abundant in space Harry Kroto (at the suggestion of Bob Curl, Rice University, Texas) joined up with Rick Smalley (also Texas) to use his 'cluster beam' apparatus. Smalley had pioneered the investigation of small clusters of atoms and to Kroto his technique seemed ideal for astrochemical investigations of carbon [1,3,4]. His apparatus consisted of a large vacuum chamber within which materials could be vaporised using a high power laser. In practice this laser experiment produced only tiny amounts of the interesting product but just as importantly it created 'tones' of new the data, in particular the mass spectrum of new things. The laser heated the samples to 10,000 °C (similar to the surface temperatures of a star) and the products were swept into a interstellar space-like vacuum chamber. Therefore the laboratory apparatus was an interesting analogue of processes occurring in space. When graphite was introduced into the apparatus it was immediately apparent that the results were very interesting. Below 20 carbon atoms the data seemed to fit in with was known in space but above 20 atoms, and especially from 60 carbon atoms onward, it appeared that something new had accidentally been uncovered . The peak at 60 carbon atoms - the C60 molecule - seemed very special indeed as it tended to dominate the data. Remember that what they were vaporising was graphite - sheets of atoms arranged in hexagons. On heating up by the laser these atoms appeared to be (spontaneously) rearranging to form all sorts of interesting structures. It was proposed that the graphite sheets might be curling up to form cages, which being closed-up might account for their stability. In their efforts to understand what was going on in these experiments the scientists remembered the architectural structures of Richard Buckminster Fuller. A famous example of RB Fullers work includes the enormous Expo 67 dome in Montreal, Canada . He inspired architectural buildings such as the Epcot center in Disneyland (Florida, USA) and the Eden project (Cornwall, UK). Studying these structures they look like they are composed of hexagons (often the hexagons are subdivided into 6 regular triangles). Looking down on a dome you see that at the top there is also a pentagon (also triangulated but with irregular triangles) followed by five other pentagons around the base. For a dome 6 pentagons are required. Two domes joined to form a cage or sphere would require 12 pentagons. 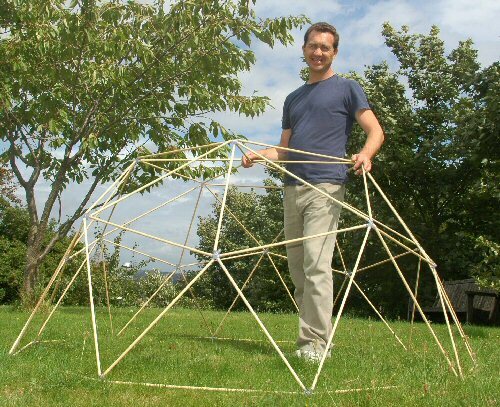 The author with a small home-made geodesic dome composed of wooden dowels. Once the scientists noticed that Fuller incorporated pentagons into his structures they started to include pentagons into their 'hexagonal' graphite models. Each time a pentagon was introduced it curved the hexagon sheet a little, until with 12 pentagons the sheet closes up into a cage, or ball. 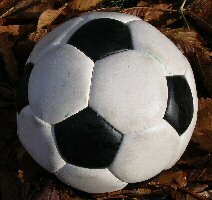 If we separate every pentagon by a single edge a particularly elegant solution appears � it's a football ! 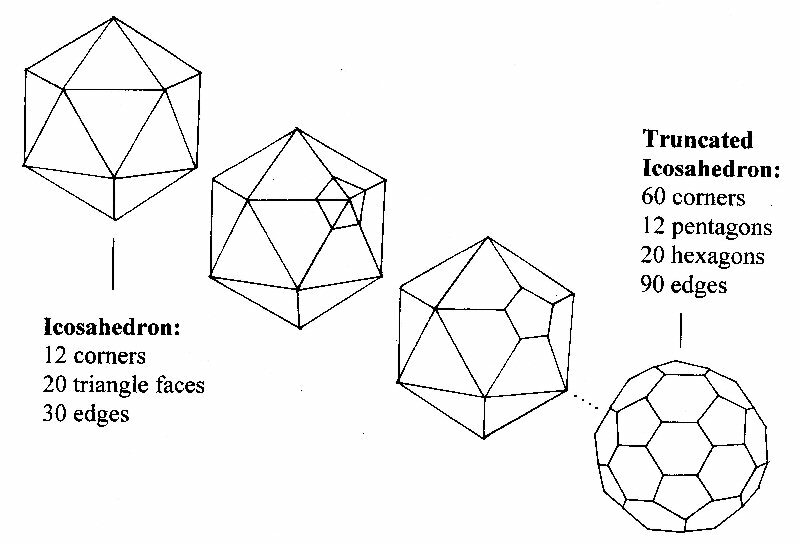 (more accurately called the truncated icosahedron [1,3,4] see diagram). Now as each of the 12 pentagon has five corners and there are no corners not in pentagons (take a long look at a football) then we must have 12 x 5 = 60 corners or vertices � exactly the number that seemed so special in the experiment. Suddenly they could propose a structure for C60. The fact that pentagons are essential for closure was crucial in the structural solution of the football C60 proposal and so Harry Kroto named the molecule Buckminsterfullerene, or Buckyball in honour of the architect [1,3,4]. Not only are there vast hoards of molecules in interstellar clouds but these clouds also contain particles which astronomers call 'dust'. In the 1990's several groups were performing laboratory experiments to try and understand this dust in detail by making carbon dust by electrically arching carbon rods. While working in Harry Kroto's group, I and others developed a way to make large (large to a chemist) gram quantities of the fullerenes [3,4,9] during arcing within He or Ar gas at reduced pressure (1/10th atmospheric pressure). The black soot produced can be up to 10% (by weight) C60. The molecules can be solvent extracted (toluene, hexane etc.) for purification and for performing chemical reactions . A buzz word of modern technology is nanotechnology. These are structures a few billionth of a meter in size i.e. several nanometers (few nm) - hence 'nanotechnology'. The fullerenes are nm's in diameter so are therefore at the heart of a new branch of nanotechnology. Fullerenes can also form into tubes called nanotubes [3,4,6,14,15]. These are a few nanometer in diameter (hence their name) but can be relatively very long. The tubes can be insulating, semiconducting or conducting (metallic) depending on their diameter. Hence it's possible to envisage a nano-cable made of a tiny conducting inner nanotube surrounded by a slightly larger diameter insulating outer carbon nanotube (CNT). Estimates suggest that tubes may be 100 times the strength of steel but a 1/6th of the weight! Recently a single CNT was used as a resonant detector, tuner and amplifier in the world's smallest FM radio. It is interesting to note that both the discovery of C60 (ca. 1985; molecules in space) and the method of production (ca. 1990; dust in space) students played a very important part in the developments [3,4,8]. This was partly because the researchers were positively displaced towards using students for 'frontier research' and partly because such curiosity driven endeavours are hard to get funding for. Students often came with bursaries (British Gas in my case) which helps get interesting and unusual investigations started quickly without the bureaucracy and red tape of additional fund raising. Most crucially as the work develops students are adaptable. A very focused research group would not be nearly so versatile. Since 1990 Harry Kroto and I have been presenting 100's of talks and workshops to schools, colleges and science festivals . Recently with the Vega Science Trust (Gill Watson and Harry Kroto) we have made a series of mini-films for teacher, pupils and students explaining fullerenes in more details as well as other areas of science [13,14]. The jump in size from the Earth to a football is about the same leap as from a football to a molecule of C60. Being about a nanometer in diameter, C60 is therefore a wonderfully simple way of appreciating the fascinating new world of fullerene nanotechnology. 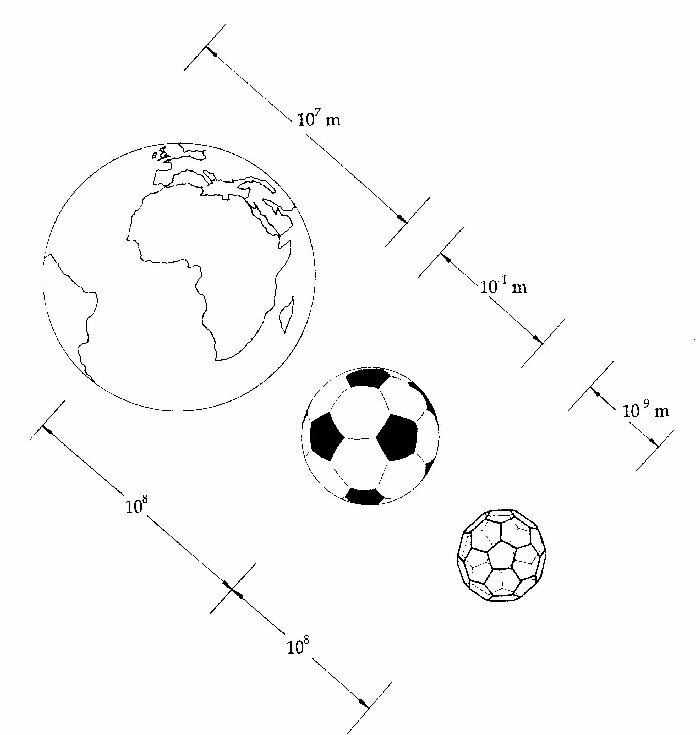 A football is as many times smaller than the Earth as a C60 molecule is to a football. A jump of about 100,000,000 times . Discovery of C60, HW Kroto, JR Heath, SC O'Brien, RF Curl, RE Smalley, Nature, 1985, 318, 162. The Most Beautiful Molecule, Hugh Aldersly Williams, Aurum Press, 1994. ISBN 1 85410 303 2. Designing the molecular world, Philip Ball, Princiton University Press, 1994. ISBN 0 691 000581. Molecules with sunglasses Horizon, BBC TV, 1992. C60, Buckminsterfullerene; extraction, characterisation and astrophysical implications. JP Hare PhD thesis, Sussex University, 1993. A Postbuckminsterfullerene view of carbon in the galaxy, JP Hare and HW Kroto, Accounts of Chemical Research, 1992, 25, 106-112.